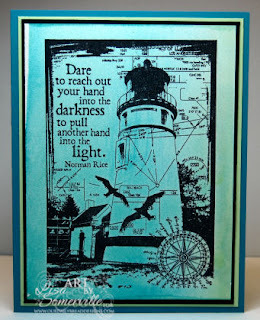 I love Lighthouses, so it's no wonder that I had to have Keep My Lamp Burning from Our Daily Bread Designs. This set works wonderfully with many different techniques. Today, I'm sharing two quick and easy ones that I use quite often. This first card uses the Burnt Edges Technique. I used the following Distress Inks to achieve my background - Antique Linen, Straw, Corduroy and Black Soot. 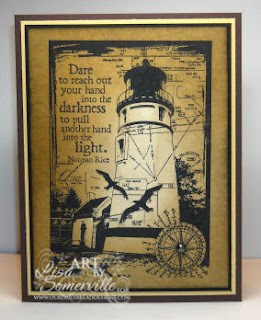 The Lighthouse and sentiment were stamped in Black Archival. Wanting to make this same card a bit more colorful - I used the Spectrum Roll Technique and my Caribbean Sea Spectrum Pad, and of course changed my card stock panels. To get proper placement of the sentiment on both cards, I used my Stamp-a-ma-jig. ETA - Cheryl, I don't have an email to contact you. But to answer your question, the lighthouse is stamped on Vanilla card stock, which I had already done the Burnt Edges Technique on using Distress Inks. Hope that helps! I always love what you do~! It the burnt edges on the bkgrnd with the lighthouse c/s??? Lisa, these are both so awesome!! Wow, so cool!!! Lisa I agree with Kelly awesome!